I was not planning to post anything until tomorrow but I got up really early after the very strong earthquake we sensed today at 7.15 a.m. Memories came back after the 1999 earthquake with epicentre Parnitha, near Athens. After being assured by the mass media that no damages occurred anywhere in Greece and there would be no after earthquake shocks it was too late to go to bed again as we were still trembling. I decided to distract myself by posting a recipe I had made a few days ago. Briam is a very versatile Greek vegetarian dish and practically you can just use any vegetables when you want to clean up your refrigerator. The main ingredients which I use are zucchini, carrots, potatoes, eggplants, onions, garlic, tomatoes, parsley, lemon juice and olive oil and seasoning. However, briam can be made with any vegetable you like most, such as artichokes, mushrooms, peppers, okra, green broad beans, etc. 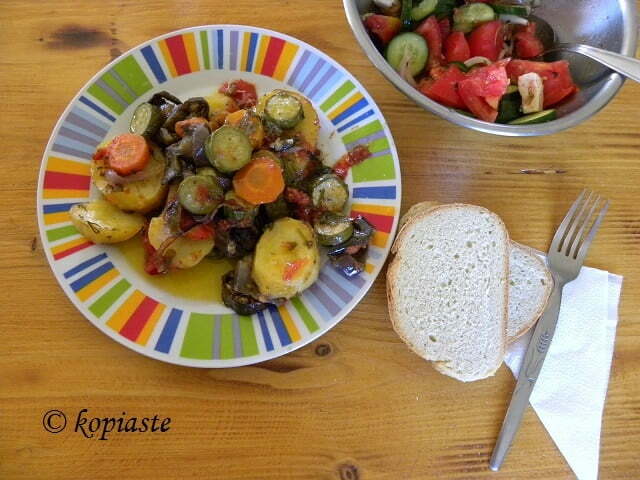 and is usually served as a main dish but it would also make a wonderful side dish if you like. If you want it to be more rich crumble some feta cheese in 20 minutes before the end. Needless to say how delicious this dish is. The potatoes absorb all the wonderful flavours from the olive oil as well as from the vegetables added, which caramelize and mellow, giving a natural sweetness to this dish. Place all the vegetables in a large, heavy baking pan and mix. Add salt, pepper, oregano and thyme, olive oil and lemon juice and toss together. Arrange all the potatoes to be the bottom layer and put the remaining vegetables on top. Bake in a preheated oven until tender (about 1 – 1 1/2 hours, according to your oven), stirring occasionally. Do not add any water as the vegetables will extract a lot of juices. If at the end you see that the vegetables are sticking to the pan, add the water and turn off the heat. Let them sit for ten minutes and then serve. Serve with feta or with Greek Salad. Love learning about this dish, which I hadn’t heard of before. I can imagine with the long slow cooking time all the flavors will blend together into something wonderful. I must have a bit of feta cheese on mine! Ivy, Briam has to one the most satisfying vegetable dishes, great for “nisteia” too! Yes you are right. Actually I mentioned that in the Greek recipe. Thanks, Ivy and Kalyn! We’re trying to start the New Year off by eating a little healthier (but also enjoying our meals) and Briam looks like it would be a great start. Ivy, I’m so glad you had no injuries or damage from the earthquake, I’m sure it was very scary!